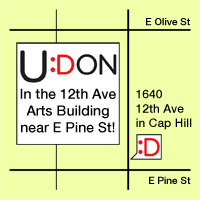 ← Picture Day at U:Don! 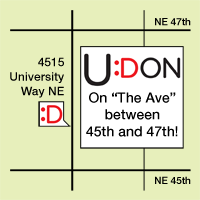 The grand opening of U:Don Fresh Japanese Noodle Station is nearly upon us! We’ve been working hard on kitchen training and other vital preparations. In the gallery below, you can see General Manager Lucas Allensworth and Kitchen Lead Matt Hulsey setting up the new tables and chairs in the dining room. The photos on the wall are a collaboration between Scott Pitts’ food photography and portraiture by Christopher Bachmann. Check out our cool new menu boards as well! This entry was posted in Announcements, Construction, Events. Bookmark the permalink.